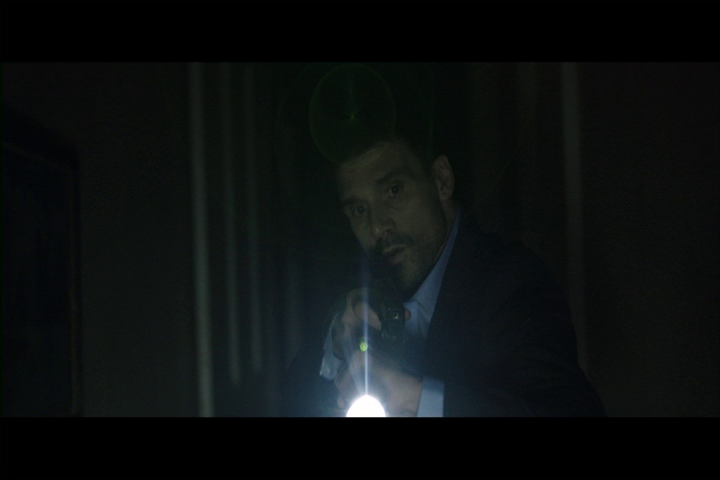 Demonic - DVD Review - ReDVDit! Demonic is a 2015 American supernatural horror film that was directed by Will Canon and written by Max La Bella, Doug Simon and Will Canon. Featuring various stars like Maria Bello (Coyote Ugly, Thank You for Smoking), Frank Grillo (Warrior, The Grey, Zero Dark Thirty), Cody Horn (End of Watch, Magic Mike), Dustin Milligan (Final Destination 3, The Campaign), Megan Park (Charlie Bartlett, The Secret Life of the American Teenager), Scott Mechlowicz (EuroTrip), Aaron Yoo (Disturbia, 21, Friday The 13th (2009)), and Alex Goode; the film centers around the violent slaughter that occurred in an abandoned house somewhere in Louisiana where three college-aged students are found dead. 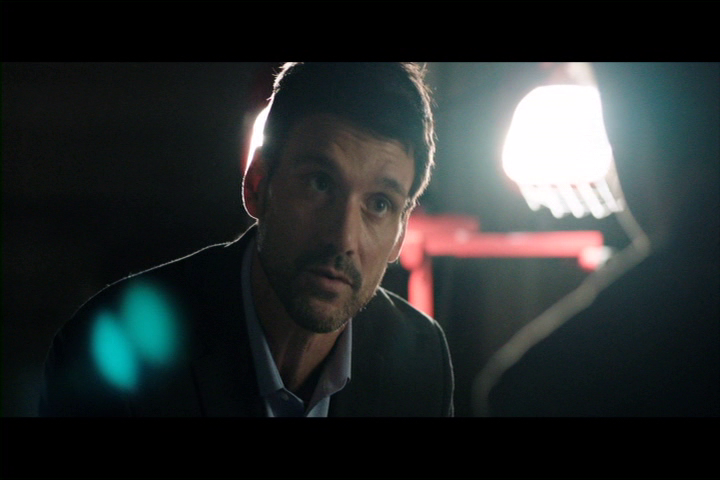 Detective Mark Lewis (Frank Grillo) is examining the crime scene and is shocked to find that there is a single survivor, John, before he calls in for reinforcements. Several police cars arrive to the house alongside an ambulance with psychologist Dr. Elizabeth Klein. She talks with John, who tells her that there was a seance that was performed in the house that called the attention of many spirits, including one who identified itself as his mother, and that two of the group members — his pregnant girlfriend, Michelle, and her ex-boyfriend, Bryan — are still missing. Originally announced on May 13, 2011 with the title of House of Horror, James Wan was set to produce the film. On November 22, 2011, it was announced that Xavier Gens would originally direct; while on October 8, 2013, the film was re-titled as Demonic. On July 31, 2014, it was announced that the film would be released on December 12, 2014; however, on September 19, 2014, the release of the film was pushed back to an unknown date. Originally making its premier on February 12, 2015 in Brazil under the title of A Casa dos Mortos, which translates to The House of the Dead, it also premiered on May 8, 2015 in Turkey. The Turkish title of the film was Şeytani Ruhlar which translates to Satanic Spirits. It was later released in Mexico on August 21, 2015 under the title of Demoniaco, which is a direct translation of the films original title. This film is currently available on Netflix in the UK and US as it made its US premiere on Spike TV on July 27, 2017 and is scheduled for DVD release on October 10, 2017. You know, I was pleasantly surprised with Demonic and the story that it told. After seeing this film arrive to my doorstep and reading the synopsis, I vaguely remembered seeing a small bit of promotional material that piqued my interest; but honestly had forgotten about it as life had gotten in the way. While the story was extremely predictable for the most part, the overall presentation of the paranormal as the group of kids perform their seance offered some new vantage points that I don’t recall ever seeing before; excluding the parts that felt very similar to the films of the Paranormal Activity film series. Surprisingly enough, despite being only made available on DVD, Demonic looked really good as it played out across my living room television. As the film progressed, I didn’t notice any signs of visual distortion in the picture and was able to visually see and understand everything as it happened. 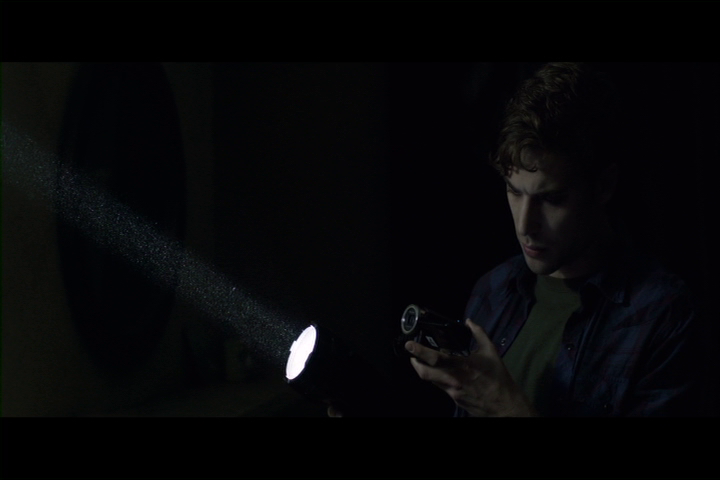 Even in the darker rooms, there was enough ambient lighting provided by the production crew that alleviated any possible eye strain while watching. The effects that were used as the paranormal wreaked their havoc among the inhabitants looked really well done and did a good job at not looking too fake. Packaged with a Dolby Digital 5.1 audio track, Demonic sounded absolutely amazing as it roared through my home theater system. Making sure to use all of the available channels, it does an absolutely fantastic job at providing an immersive experience for those who are making use of the technology. 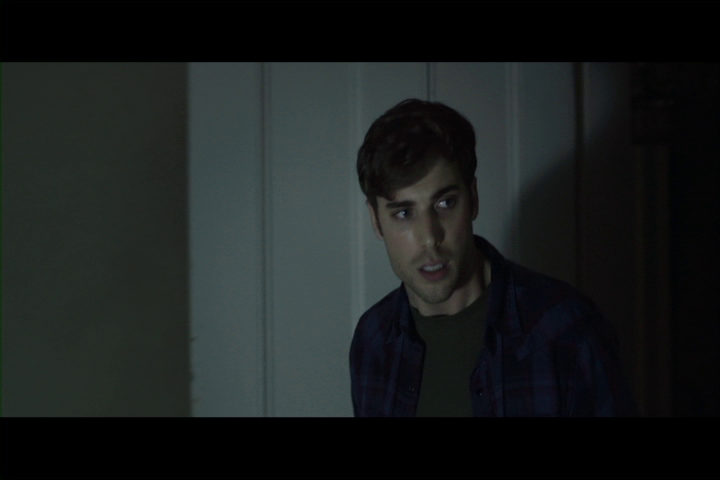 Being able to hear the lure of the paranormal entities as they wreaked havoc within the household added to the overall scare factor as you could hear them from all possible angles for a given scene. For a DVD release, this release is definitely a good one to use for showcasing audio technology within the format. Demonic is made available in your standard single disc DVD case. Within that case is the standard DVD copy of the film. The disc bears no artwork that’s related to the film at all, and only has the relative text that’s used to differentiate the disc from others within ones collection. There is no digital copy redemption pamphlet; however there is a slipcover that’s been made available with this release. Unfortunately, there are no special features available on the DVD release of Demonic. As a result, there is no scoring for this section. 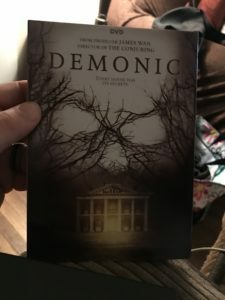 When Demonic first arrived at my doorstep, I have to admit that I was a little upset that it wasn’t a Blu-ray release. However, after further research, I discovered that there is no DVD release slated for the US. 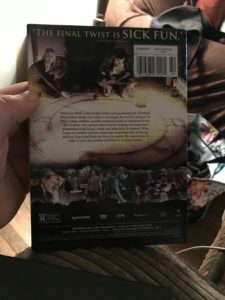 After popping the disc into my player, I was given the opportunity to envelop myself into a world of supernatural curiosity that was as immersive as one could expect from a DVD release. Offering a clear view into the experience of the kids as they try to communicate with the other side; I was genuinely pleased with this movie. Unfortunately, there are no additional features available with the DVD release of this film. But, I wouldn’t let that cause you to stray away from checking this film out. If you’re interested in adding this release to your personal collection, it will be available from your favorite retailer beginning on October 10. However, if you are set up with region free playback, there is a Region B Blu-ray release available to be imported from Denmark.